A week is a long time in social media. So now that we’re in July, a lot has happened already in 2018. 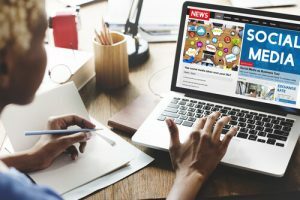 Social media remains more popular than ever, although it’s been a bumpy ride for some – as you’d expect in any industry. LinkedIn is clearly listening to its users and has responded to a desire for native video advertising and video for company pages. In 2017, 90% of all content shared by users on social media was video. Last August, the platform introduced native video uploading to users, and it quickly became popular. LinkedIn stated that more than 700 advertisers have trialled Video for Sponsored Content since October. Abhishek Shrivastava, Director of Product for LinkedIn Marketing Solutions said that, during that time, LinkedIn users spent almost three times longer watching video ads than static ads. In addition, company page videos were five times more likely than other types of content to spark conversation amongst users. Looks like listening has worked well for LinkedIn. After the Cambridge Analytica scandal, some predicted a mass exodus from users of the social media platform. Facebook faced criticism over data breaches, from politicians and commentators alike. Did that mass exodus from Facebook actually happen? Well… Facebook is now more popular than ever – the average number of monthly active Facebook users for March rose by 13%. While we all want to retain our privacy and want greater transparency from the tech giants, we remain attached to Facebook and the part it plays in our lives. It’s been around too long and is too embedded with how we communicate with the world. People accept targeted advertising as the price to be paid for what is a free means of staying in touch with family and friends. Targeted advertising that is relevant and interesting is better than boring advertising that has no value or relevance to us and our lives. Facebook remains a commercial space and those marketers who understand this thrive on the platform. It remains the ideal space to foster a relationship with present and future customers. It’s too big an opportunity for marketers to ignore. Its reach is too great. It’s good news that the industry is taking greater responsibility for the young and vulnerable. Facebook-owned messaging service WhatsApp, which has over 1.5 billion users, raised their minimum age limit from 13 to 16, in part to comply with the EU’s new data protection rules. The capability to follow hashtags makes the platform even more user friendly. Instagram says this will give users ‘new ways to stay connected with the interests, hobbies, passions, and communities you care about’. They’ve updated their algorithms too. Two years ago they moved away from a chronological algorithm but now they want to ensure that newer posts are more likely to appear first in feed. Looks like Instagram is listening too. This is in a bid to combat spam and political propaganda bots, with 50,000 accounts being linked to Russian propaganda efforts. Twitter’s own TweetDeck app once allowed users to post similar content from multiple accounts, while also automating liking, retweeting and following. Twitter says these actions are ‘an important step in ensuring we stay ahead of malicious activity targeting the crucial conversations taking place on Twitter – including elections in the United States and around the world’. Previously, to highlight relevant times during live and replayed videos, users had to send a tweet. Timestamps make those tweets unnecessary. It’s now possible to tweet live or replayed videos at the relevant moment rather than having to show the entire video. After all, as Twitter Product Manager, Mike Folgner says,‘Brevity is the soul of Twitter’. A very exciting development for Instagram users who’ll soon have access to IGTV – a long-form video feature which will allow users to post hour-long clips. This is a huge leap forward given that up until now, the maximum video length has been 60 seconds. The new IGTV platform will exist as a standalone app as well as on users’ homepage. Instagram founder Kevin Systrom said he felt a “responsibility” to make these changes to the platform given data that shows people are spending less and less time watching TV and more and more time on their phones. As each user will have their own channel where they can upload and store videos, it’ll be interesting to see how IGTV compares and competes with YouTube. All in all it’s been a fast-moving and exciting year for social media, with two emerging themes so far: the continuing popularity and success of video on social media platforms and the developers of those platforms listening to and then following feedback. That is what social media is all about after all: open and immediate interaction between participants. Social media is an ever evolving and changing landscape and 2018 so far has been no exception. It is, after all, why we all love it! If you want to find out how to take your social offering to the next level, contact us at agency:2 on 0203 598 9194. We are so proud of our social ad team, Mighty Social , and our disruptive technology which leads the way in innovation. Our AI powered campaign for Showcase Cinemas delivered impressive ROI using our unique audience insight technology. Through our commitment and agility in managing the campaign, we were able to sell out four different films exclusively on Facebook. Not only did we exceed ROI targets by 70% but we drove over 51,000 link clicks to booking sites. What a fabulous achievement to add to our awards list. The Facebook algorithm is going to change to prioritise and show more posts from friends and family (i.e., people in your network) and less from businesses, brands, and other public pages – but these will not be entirely removed. The algorithms will now prioritise posts that are likely to generate person-to-person (people within your network) interactions rather than person-to-Page. The algorithm will prioritise posts that spark conversations and meaningful interactions between people. Adam Mosseri, Head of News Feed at Facebook says, ‘To do this, we will predict which posts you might want to interact with your friends about, and show these posts higher in feed. Facebook says the move will not affect advertisements – users will continue to see the same ads as before. However, ads are likely to get more expensive as brands move away from organic content to paid in order to reach their audiences. Why have Facebook made this change? Facebook are trying to encourage ‘more meaningful interactions’ rather than ‘passive usage’ of Facebook (i.e., scrolling, not interacting, or ‘surface interactions’ such as likes and shares) which research has shown can contribute to feelings of depression and isolation. Whereas connecting with people we care about by commenting and engaging in ongoing discussion on social media promotes wellbeing. How will it affect marketers and brands? It is likely that organic reach, organic video watch time and organic referral traffic will decrease. Mark Zuckerberg – ‘Now, I want to be clear: by making these changes, I expect the time people spend on Facebook and some measures of engagement will go down.’. Pages making posts that people generally don’t react to or comment on could see the biggest decreases in distribution. Pages whose posts prompt conversations between friends will see less of an effect. People who want to see more posts from Pages they follow can choose See First in News Feed Preferences to make sure they always see posts from their favourite Pages. What are our recommendations for marketers? Become even smarter with social media advertising: apply accurate segmentation techniques. Drive better results by matching ad creatives with audience insights. Paid posts will have to be: engaging, original and make people feel good – as well as encouraging interactions. Make better use of Facebook Groups to help increase engagement. Dedicate more time to responding to comments and to engaging in Groups. Make better use of Facebook Live. Live videos tend to generate more comments and interaction because people can do so in real time. Live videos often lead to discussion among viewers on Facebook – in fact, live videos on average get six times as many interactions as regular videos. Learn how to take advantage of Facebook Live by reading our blog. Continue to encourage meaningful interactions and conversations – getting people to engage by commenting and starting back-and-forth discussions within the community and wider network – i.e., getting the audience to invite their friends and family to comment and discuss it. Avoid using “engagement-bait” (goading people into commenting on or reacting to posts) as it is not a meaningful interaction and Facebook will continue to demote these posts in the News Feed. Live video marketing has become an extraordinary trend in the online marketing world over the last two years. Thanks to the introduction of Facebook Live, Instagram Live and Livestream for example, brands are working harder than ever to bring educating, fun and interesting live videos to their customers. What is Facebook Live and why do brands want to use it? As we move quickly towards 2018, we have seen more and more brands using this exciting tool and anticipate even higher usage in the coming months with the goal of increasing brand awareness and boosting audience engagement – helping to bring their brand to life on the page. What does Facebook Live work well for? What are the benefits of broadcasting Facebook Live? Top Tip: Facebook has introduced scheduling for live videos which means that fans can subscribe to the feed in advance and therefore build audiences proactively. Top Tip: Direct moderation of Facebook Live content is an opportunity to reinforce value propositions; this should be reflected in the campaign strategy in order to maximise potential. If you need technical expertise or want to find out how to take your social offering to the next level, contact us at agency:2 on 0203 567 1380. Social Media Evolution: Facebook ads – where did it all begin? With the recent introduction of Facebook Stories to rival Snapchat stories, it’s pretty clear that Facebook is constantly evolving as a business and significantly changing the social media marketing game. In fact, according to Fortune, Facebook seem to be unstoppable when it comes to growth despite the “law of large numbers.” But where did it all begin? Our new infographic shows steady growth from the very start, innovation at every stage and long-term evolution into the social media giant they are today. The Global Shorty Awards honours the year’s best accomplishments in social media across the world. The ceremony was held at the glamourous PlayStation Theatre in New York and was hosted by celebrities, including the actor Tony Hale and attended by many social media influencers. There were even some four legged Instagram stars sharing the front row with us, such as the adorable Tinkerbell the dog! We delivered a performance driven Facebook ad campaign for our client Showcase Cinemas, which was fuelled by our unique audience insights technology – the Social Insight Engine. 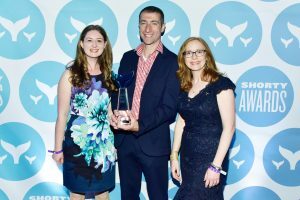 Joel, Sharon and Victoria were truly honoured to collect our winning trophy for this highly competitive category, which saw some of the world’s leading digital agencies enter their Facebook campaigns. After the awards ceremony the celebrations continued with the Shorty Awards after-party, which has held at the stunning Refinery Rooftop bar, which had an incredible view of the Empire State Building! This party was the perfect place to connect with other social leaders and we’re coming home to London filled with new ideas for connecting with influencers we met over cocktails. 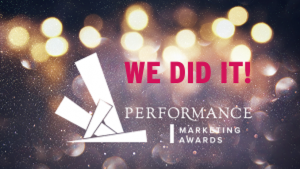 We would like to thank our client Showcase Cinemas and our team in the office who worked so hard on the campaign. Together we truly pushed the boundaries of what excellent Facebook marketing can deliver and we proved its ability as a highly cost-effective acquisition channel for businesses. We are delighted to announce some exciting awards news today. We are a Shorty Awards winner: Best use of Facebook. 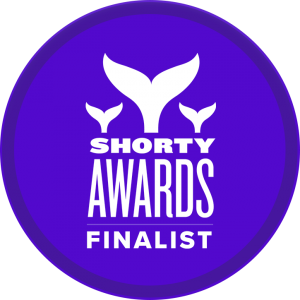 A couple of months ago we entered one of our Facebook advertising campaigns for the prestigious Shorty Awards. The award honours the best in social media across the globe, with a glitzy ceremony held in New York on 23 April 2017. We delivered a ground-breaking Facebook campaign for our client Showcase Cinemas which was fuelled by our unique audience insights technology – the Social Insight Engine. By tapping into the audience’s passions and interests on social, we achieved outstanding social media marketing results for our client. Our team of paid social media experts and the creative team here at agency:2 are very proud of the campaign results. 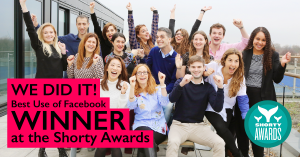 Today we received the fantastic news that agency:2 is a winner of this highly competitive category which saw some of the world’s leading digital agencies enter their Facebook campaigns. We would like to thank our client Showcase Cinemas and our team here. Together we truly pushed the boundaries of what excellent Facebook marketing can deliver and we proved its ability as a highly cost-effective acquisition channel for businesses. We are thrilled to announce that our Showcase Cinema ‘The Great Race Cinema Launch’ campaign has been selected as a finalist in the Shorty Awards for Best Use of Facebook. Every year the Shorty Awards honour the best work across social media’s vast and growing landscape. Now in its ninth year, the Shorty Awards continues to recognise the most innovative, creative, and culturally relevant brands, organisations, agencies and influencers on social media. It’s the 4th award in 4 months for our social media company adding to our CIM, Drum & Deloitte accolades! We are a Deloitte Technology Fast 500 EMEA Winner! agency:2 is thrilled to be ranked the 144th fastest growing tech companies in Europe, the Middle East and Africa (EMEA). We would like to thank our amazing clients and hard-working team for helping us to achieve this fantastic recognition by Deloitte. The Deloitte Technology Fast 500™ EMEA award is a prestigious acknowledgement of the 500 fastest-growing technology, media, telecommunications, life sciences and energy tech companies across EMEA. agency:2 is an award-winning social media agency powered by audience insight technology. Our leading social media advertising technologies and expertise enable us to deliver results that far exceed expectations. As innovators for the social ad industry, we work with world leading brands such as Barbie, Worldpay and Sony to deliver the best social media results. By now you’ve seen the ads from Facebook encouraging you to go live. 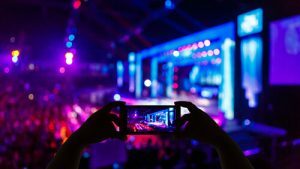 While it might be easy for individuals to post a quick live video, how does it work for brands? Is it a worthwhile marketing proposition to get involved with? As we move quickly towards 2017, we think that more and more brands will be using this exciting tool in the coming months to increase brand awareness and boost audience engagement – helping to bring their brand to life on the page. Top Tip: Facebook is about to introduce scheduling for live videos which means that fans can subscribe to the feed in advance and brands can therefore build audiences proactively. We have given you all the tips to really make the most of this exciting social media marketing tool. So now you’re ready to go Live – sit back and watch the engagement go crazy!